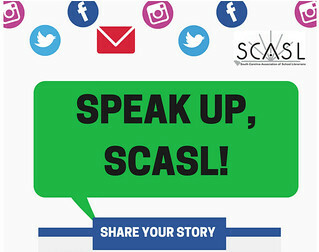 SCASL News | July 2018 | Speak Up, SCASL! Look at that month’s topic. Take a photo and write a message. Post or email your message. Include the hashtag #scaslleg and your school/district hashtags. August: School librarians plan best practice programming for back-to-school. September: School libraries celebrate diversity in all its forms. October: School librarians fight fake news by teaching how to find and evaluate credible resources. November: School librarians create effective and engaging professional development for our teachers. December: School librarians are technology specialists. January: School librarians connect students to global learning opportunities. February: School librarians create programs inclusive of every child. March: School librarians stay relevant by attending and presenting at conferences. April: School librarians advocate for our students. May: School librarians build a culture of reading in our schools and communities. Please print the attached graphic and post near your desk to remember to participate each month. Adapted with permission from “Let’s Promote Libraries” by the Texas Association of School Librarians, 2017.To see the connected AASL Standards for each month visit this Google Doc.